Cotswolds self catering holiday rental, Stroud, Gloucestershire: The Old Chapel in Slad. The Cotswolds is designated as England's largest 'Area of Outstanding Natural Beauty' – as an area it’s 100 miles north to south. Here in the West Cotswolds the area has a slightly wilder nature, especially in the five beautiful valleys around Stroud, of which Slad Valley is considered the most unspoiled. These are the real Cotswold Hills, steep climbs and wonderful views, a drive away from the crowds of tourists you find in north Gloucestershire. Snows Farm Nature reserve – Just across the Slad Valley you'll find a mixture of meadow, woodland and utter tranquility. Stunning. 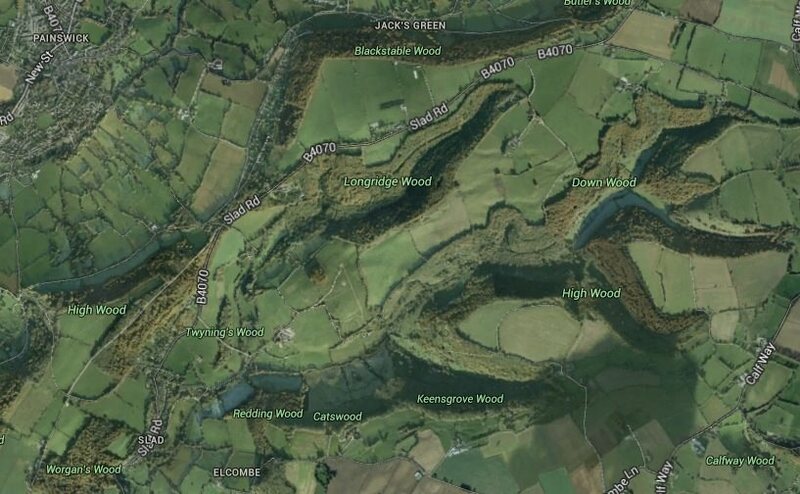 Swift’s Nature Reserve – a steep climb brings you breath-taking views and 13 species of wild orchid, overlooking Slad Valley and across the Severn to Wales. Adjacent to Laurie Lee Wood, another beautiful ancient woodland, named after the valley's most famous former resident. Frith Wood Nature Reserve - behind The Old Chapel, this lovely ancient beech wood is brimming with wildlife including deer, and provides a 30-60 minute walk. Painswick Beacon has the best views in the area, with Wales clearly visible. Across it passes the famous Cotswolds Way, a 100 mile trail of walking paths, and bizarrely, a golf course. The Beacon is a short drive from Slad. Rodborough Common (3 miles) - a favourite picnic site, overlooking the next valley. See pic on right. And a good pub - The Bear. Selsley Common (4 miles) - fantastic hill-top views and wonderful wildlife. Painswick Rococo Garden (3 miles) – the last remaining Rococo garden, carefully restored using an original painting as a blueprint, and boasting a brand new Anniversary Maze. Woodchester Mansion (5 miles) – an unfinished Gothic masterpiece – suspended in time but revealing many of its structural secrets. Check the website for open days. Prinknash Abbey, and the adjoining Prinknash Bird Park (4 miles) – the serene promontory setting of a modern abbey, pottery and tearooms, combined with a perfect venue for children who will enjoy the pygmy goats, baby deer and feeding trout. Westonbirt Arboretum (17 miles) – stunning landscaped grounds, which are home to some of the world’s tallest, oldest and rarest trees. Delight the children with a visit to Cattle Country (17 miles) – an outdoor Adventure Playground and indoor chutes, slides, and scramble nets. Ornothologists should visit Slimbridge Wetland Centre (13 miles), the only place in Britain to see all six varieties of flamingo! And there's more…Selsley Herb Nursery at Bisley, the Jenner Museum and, set amidst a splendid tree collection overlooking the lake in Stroud's Stratford Park, Stroud’s Museum In The Park displays elements of the District’s local history never before on view. For local Roman interest, Cirencester's Corinium Museum is a horde of Roman history, Bath has its world-famous Roman spa and the Roman Villa (6 miles away) has the remains of a large and luxurious Roman villa built around AD250, with bathhouse complex. Within a short drive you can also discover historic houses, such as Owlpen Manor (10 miles) and Chavenage (13 miles) and the historic Sudeley Castle and gardens (20 miles). You could spend a week just driving around the honey-coloured market towns and villages of the Cotswolds admiring the timeless beauty of this unspoilt part of England. The official Cotswolds tourist site lists most of the best places. 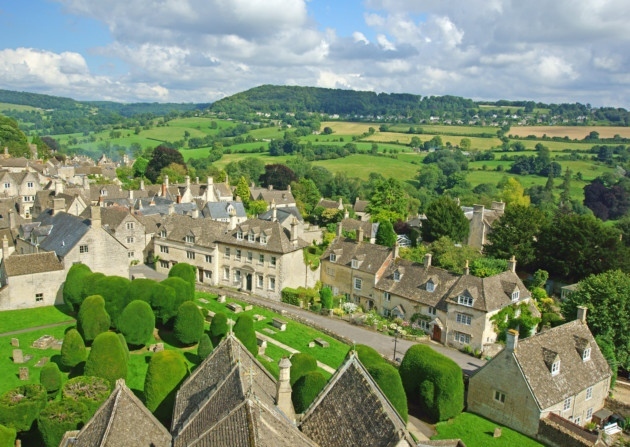 Painswick (pictured below), known as the Queen of the Cotswolds, is less than two miles over the hill behind the Old Chapel, and is an absolute must. Everyone has their favourite villages, but locally we love the understated Bisley, Miserden, Sheepscombe and Minchinhampton. A little further you'll find Cirencester (Roman capital of Britain), Tetbury (where Prince Charles has a food shop), Bibury (very photogenic and with a great trout farm), Winchcombe and (when it's less crowded, out of season) the incredibly twee Bourton-on-the-Water with its bird park and miniature village. In the village of Slad we are lucky to be a few moments walk from one of the great pubs of the Cotswolds, The Woolpack Inn, offering a great range of local ales, ciders and wines, and a modern menu, in a setting otherwise untouched by time. Locally there are numerous excellent pubs and restaurants in the area to suit all budgets, tastes and occasions. Check Tripadvisor for reviews. Stroud market is a foodies' paradise, just a ten minute drive from the Old Chapel. Held every Saturday morning, this award-winning farmers' market (twice winner of the best in the UK) has a huge range of meat and fish, local vegetables, cheese, ciders and beers, breads, olives, donuts, dairy products, in the bustling old centre of Stroud. Don't miss it! From gliding and hot air ballooning to clay-pigeon shooting, and a range of water sports, the Stroud district has plenty for adrenaline junkies. If you like mountain biking or road riding, the immediate area around the Old Chapel is moderate to challenging terrain with plenty of climb and descent. There's even a dry ski slope in Gloucester, just a 15 minute drive away. Every Summer Stroud (and Cirencester amongst other places) hosts Giffords Circus - charming, nostalgic and unmissable. Stroud Fringe Festival, Cheltenham Jazz Festival, Cheltenham Literary Festival, Cheltenham Science Festival, Painswick Art Couture, and numerous summer fetes are held every year.